STUNNING 3/2 WILLIAMSBURG PREMIER w/3 CAR GARAGE and PRIVACY IN BACK located in the VILLAGE OF PINELLAS at CEDAR GROVE. 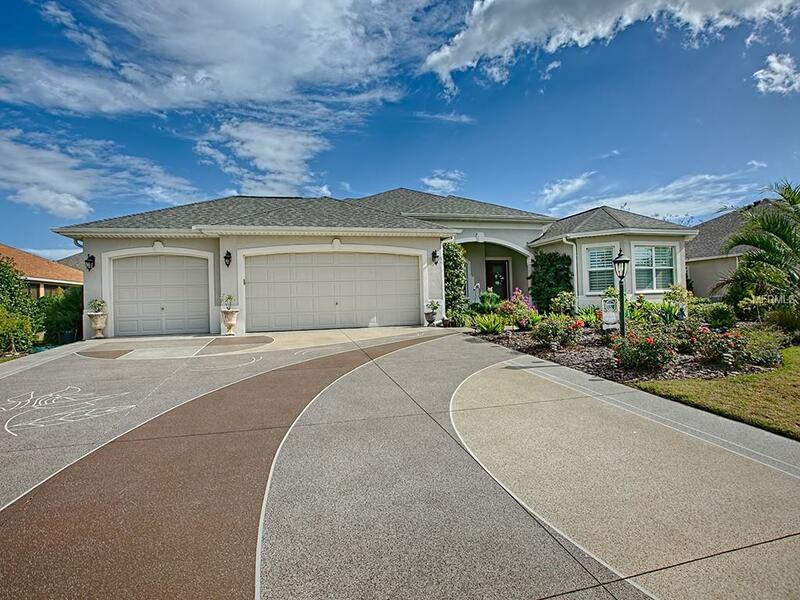 LOVELY curb appeal with ARISTOCRETE coated driveway & walkway and ENHANCED LANDSCAPING! Enter through the LEADED GLASS front door w/sidelight to DIAGONAL TILE flooring that flows throughout foyer, living/dining rooms, kitchen and baths w/ carpet in the bedrooms. CROWN MOLDING, PLANTATION SHUTTERS & CUSTOM LIGHT FIXTURES enhance the entire home. The SPACIOUS, OPEN kitchen has lovely espresso cabinets, GRANITE COUNTERS, GLASS BACK SPLASH, under counter LIGHTING, upper and lower pull-outs, pot drawers, FRENCH DOOR REFRIGERATOR, SMOOTH TOP ELECTRIC BUILT IN range, WINE RACK, closet PANTRY and CENTER island! ADDITIONAL bisque cabinets were added in the eat-in area for even more storage space! The GORGEOUS dining and living room open w/STACK BACK doors to the EXPANDED SCREENED lanai w/CHATTAHOOCHEE RIVER ROCK flooring w/ COMPLETE PRIVACY! The master bedroom features French doors to the lanai, tray ceiling w/CROWN MOLDING, MOUNTED TV, his/her walk-in closets, en-suite bathroom w/WALK-IN shower, dual sinks & separate toilet room. Enter guest area thru pocket door to bedrooms w/ carpet and PLANTATION SHUTTERS. 2nd guest room has private entry to the shared guest bath w/tub/shower, glass enclosure, GRANITE and linen closet. The laundry room has additional cabinets, set tub and FRONT LOAD washer and dryer. WHOLE HOUSE SOFTENER and FILTRATION. TURNKEY PACKAGE NEGOTIABLE! This is a GORGEOUS HOME!